Pray for them and I hope it wasn't arson. I just saw this and was about to post the same thing. How horrible! Hopefully it was an accident related to construction (not that I wish anything like this) and not arson. Hopefully now they will finally restore the place. When I visited last spring, there was some scaffolding but no work was being done. And it hasn't been done for well nigh 150 years. Pieces of stonework were falling from the facade, and signs were posted alerting visitors to the fatal danger. Acquaintances in the cultural sector told me that the hope is that some American billionaire will pay to restore it in some gesture of benefaction. Part of the reason no work has been done is because closing the church means a loss of tourism. Things are now so bad that buttresses are in danger of collapsing outright, and the cathedral routinely tops lists of endangered cultural sites, in spite of being in a world-class city in a wealthy country. 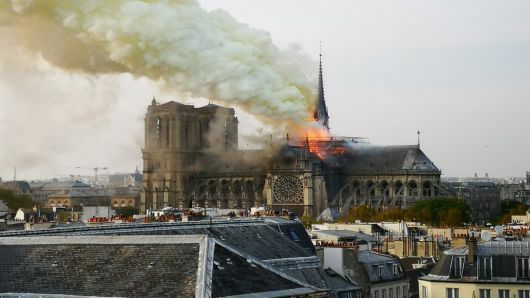 If the fire is the work of Ahmed, Muhammad, Mahmud, and the rest of the gang, and if the damage actually provides the rationale to finally restore the Cathedral, Christendom will owe the Muslims a certain debt of gratitude. (04-15-2019, 02:03 PM)Cyriacus Wrote: Hopefully now they will finally restore the place. When I visited last spring, there was some scaffolding but no work was being done. And it hasn't been done for well nigh 150 years. Pieces of stonework were falling from the facade, and signs were posted alerting visitors to the fatal danger. Acquaintances in the cultural sector told me that the hope is that some American billionaire will pay to restore it in some gesture of benefaction. Can they afford to repair it? From an article I read it has been in a state of disrepair for years and the diocese had to raise funds to do the little they are doing now. (04-15-2019, 02:33 PM)Eddo36 Wrote: Can they afford to repair it? From an article I read it has been in a state of disrepair for years and the diocese had to raise funds to do the little they are doing now. Not to sidetrack, but I thought the cathedral was owned by the French state, something that came about from the French revolution. Regardless, it brings in somewhere around 13 million visitors a year, so with the positive economic impact to the area, you'd think the state would be willing to cough up funds to repair it. From the reports of the fire they may unfortunately have a clean slate to start from. (04-15-2019, 01:53 PM)Jeeter Wrote: I just saw this and was about to post the same thing. How horrible! How the Hell would they know that before the fire's even put out and arson investigators have investigated it? French churches have been burning at a rate of about one a month lately. Shall we place bets on whether the social justice brigade will protest this hate crime? Our Lady, Queen of France, defend and protect the poor and suffering "eldest daughter" of your Son's Church. God help us all.